The pet store claimed the hairless cat would be hypoallergenic, but you found out otherwise. You're allergic to long-haired cats, so you adopted a short-haired breed. But you turned out to be allergic to short-haired cats, too. Cue the hairless cat. But she still causes coughing, sneezing, itchy eyes and wheezing. Find out why your bald kitty is giving you allergy symptoms. You're in good company -- approximately 10 percent of Americans are allergic to their pets, and cat allergies are the most common, according to WebMD. Allergy symptoms range from mild to severe and may include itchy eyes, coughing, wheezing, congestion, sneezing and respiratory problems such as asthma. Twenty percent to 30 percent of asthmatics have severe attacks around cats. A friendly kiss or lick from Kitty can lead to hives, itchy skin or rashes. Symptoms might appear a few minutes or several hours after coming into contact with a feline. If you think adopting a hairless cat will eliminate your allergies, think again. There's no such animal as a hypoallergenic cat -- though those with certain hair and shedding characteristics are called such. Individuals offer anecdotal evidence that certain breeds affect them more or less drastically, but no breed has been proven to lessen allergies in susceptible individuals. It also doesn't matter if you own a long-haired, short-haired or no-haired cat -- they all have the potential to cause allergic symptoms. Some cats might produce less of the allergen protein, but all shed it in varying degrees. A tiny amount can make some allergy-prone people sick. 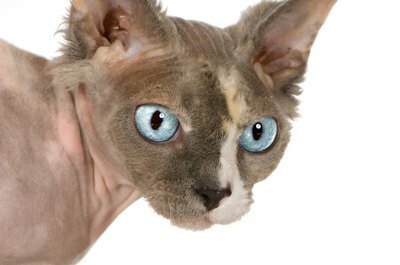 You might be wondering how you can possibly be allergic to a hairless cat. Simple -- it's not the hair that triggers allergies, it's proteins in her urine, saliva and dried flakes of skin, more commonly known as dander. Because dander particles are so fine, they're able to remain airborne for long periods of time, making them easy to inhale. They also cling to just about everything -- clothing, furniture, carpets, walls, curtains, and your skin and hair. An over-alert immune system interprets allergens as potentially harmful invaders. Allergy symptoms result when your body attacks the allergens as a defensive measure. You don't have to give your best friend away, bald or not. Consult with an allergist to develop the best treatment plan, according to how severe your symptoms are. One option is to receive allergy shots that may include regular injections of cat protein to trick your immune system into ceasing to attack the allergen. However, it's not a quick-fix solution -- it can take up to five years to complete the series of shots and notice results. Over-the-counter medications, such as decongestants and antihistamines, can help reduce inflammation and congestion. For more severe symptoms, your allergist can prescribe stronger medication. Becoming a cleaning fanatic could lead to improved health. The more dander and other allergen proteins you can remove from your home the greater the chances of eliminating allergic symptoms. Air purifiers that contain HEPA filters can remove up to 99 percent of dander in the air, according to the Environmental Protection Agency. Place air purifiers in rooms where your hairless kitty hangs out. Use a vacuum with a HEPA filter on carpets, upholstered furniture and curtains. Remove dander from bare floors with a damp mop and mild soap. And although it won't be easy to give up snuggling with Kitty at night, keep her out of your bedroom. Go Ask Alice: What to Do About My Partner Who's Allergic to My Pets? WebMD: Do Hypoallergenic Cats Exist? Do All Chihuahuas Have Short Hair at Birth?